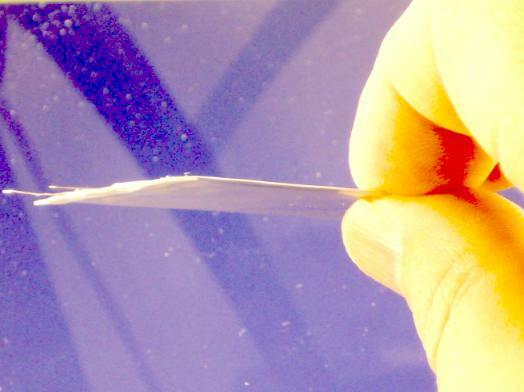 Cells as thin as 500 microns, and bendable! Batteries, Chargers, and Power Supplies, Custom and off-the-shelf. 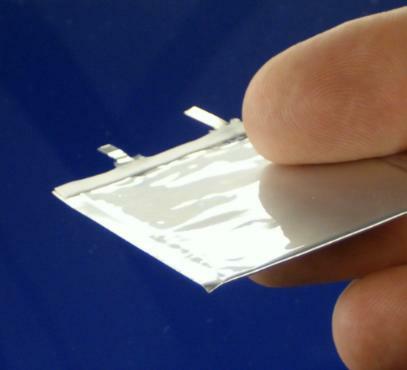 PowerStream has been working with a team of engineers in China to develop the thinnest possible lithium polymer batteries. 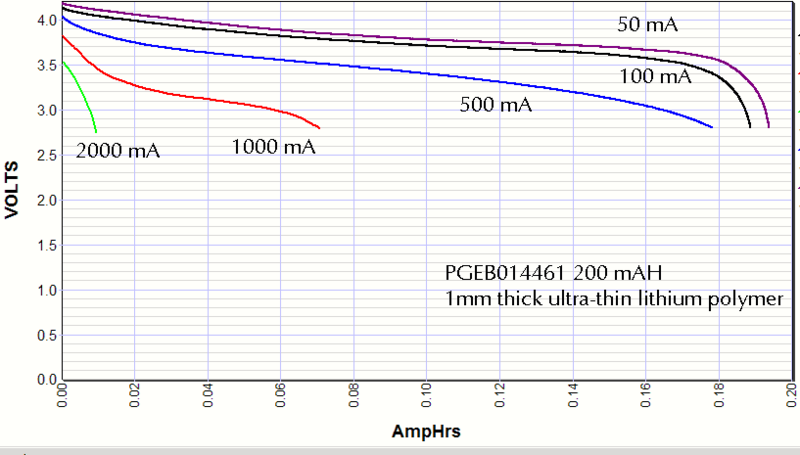 We can now offer design engineers batteries of 2.0 mm to 0.5 mm thick. These cells should be useful for smart cards, RFID tags and other applications that require energy storage in a very thin battery. Lithium ion cells are used in a wide variety of portable equipment and instruments. Lithium polymer cells have a better form factor than cylindrical cells for a variety of applications, such as cell phones, PDAs, cameras. These cells are high-quality Chinese cells, made in an ISO certified environment. PowerStream has qualified this factory as being one of the premier factories for lithium polymer cells. Not exactly paper thin, but as thin as we know how! Though these cells have small capacities they are about the same as coin and button cells and have a wide range of applications. There are microcontrollers that draw less than 1 microamp, such as the TI MSP430 in standby mode, so a 50 mAH battery could run these for 2 years between charges. Flat batteries can be used for military, sensors, tags, and cards. At about 2 mAH per square cm these, and with power levels at 10 mA per square cm. Since these are not thin-film batteries they are available now, have a flexible substrate, and can generate much higher powers if need be. They use a solid-electrolyte technology that minimizes or eliminates any free liquid. They do not have to be kept flat. The 0.5 mm cells can be flexed or bent into a cylinder, into a hat band, belt, etc. 7. Processing temperatures for these cells is 100°C for less than 60 seconds, 120°C for less than 20 seconds and 140°C for less than 5 seconds. 8. End-of-discharge voltage cut off 2.8 volts. Note at this time we have a few standard products (see the table with the "add to cart" buttons below. Most customers at this time are using cells made to their specifications and will require a tooling charge and minimum order of 2000 pieces. Below are listed typical parameters for such cells. These are great cells. 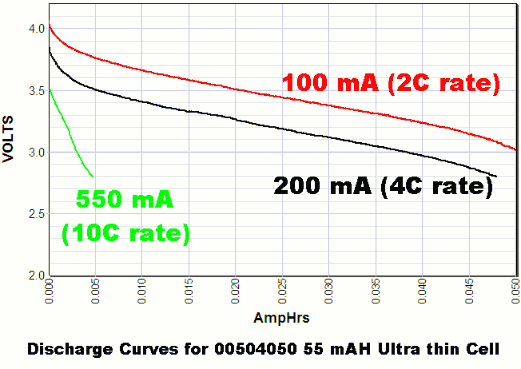 They are designed for low current discharge, but the above curve shows what they do at high current discharge rates, up to 10C. Even at half an amp (10C) there is enough energy for over 3300 pulses, 100 mSec each.